Mr. Mcnitt used to bring me tiny motors. They came from vacuums and fans and whatever other discarded items he could access. It was around the year when all I wanted for my birthday was Adidas breakaway pants like some I’d seen on NBA players. I got a kick out of how they’d tear them off after warm ups revealing their uniform shorts underneath. It was when I was still mostly unaware that boys and girls are supposed to like different things. Sometimes the motors came to me in plastic bags with little else around them. Sometimes I had to break through tiny plastic barriers to get to the parts I needed. Eventually he brought me broken motors so that I could figure out what was wrong and make them run again. I used to answer the question “what do you want to be when you grow up?” With “mechanical engineer.” Not to be confused with “a mechanic” which I may have said a few times when I was still getting the hang of the lingo. I loved the motors and I loved Mr. Mcnitt for finding them for me. He helped me explore how they worked. He helped me turn their energy into something bigger. I remember the first time I saw a tiny LED light turn on because I’d properly connected all the parts. I thought I’d really made something. My mom worked at school so I came in early with her. I started spending those early mornings with Mr. McNitt, trying to figure out what I’d create next. I moved from LED light to fan to eventually taking apart a broken vacuum motor and putting it back together so it worked again. I didn’t really know the depths of the math or science behind any of it. I just used whatever logic I had in my tiny brain (and his assistance) to work it out. A few years and a new school later I was already falling out of love with the idea of becoming a mechanical engineer. Math started to become difficult around 8th grade. I don’t know why. For the first time in my life I was operating on grade level instead of above it. My teacher was foreign but I don’t think that had anything to do with it. I understood him just fine, but math wasn’t a fun class anymore. It was the one hour of the day when things had stopped being interesting to me. It was much more exciting to pass notes, about cute boys, written in brightly colored gel pens. Nobody was bringing me motors to fix and I lost the fascination. Math mostly became more difficult. In algebra they started throwing in letters. I wasn’t ready for those worlds to collide. Everyone told me “you’ll love geometry. It uses shapes. It’s very visual.” Geometry gave me my first and only F. A fact I was so embarrassed by that I told my parents with a handwritten apology letter. They got me a tutor, a very good tutor who helped me improve my grades… But I was defeated. I was tired of working at something that seemed so difficult when every other class was easy. 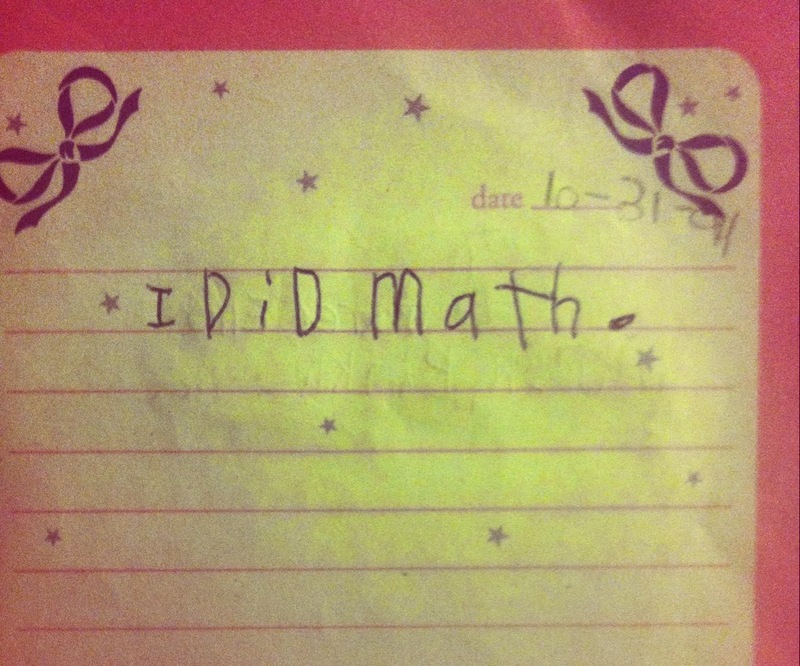 I briefly enjoyed math again when they introduced words, not letters… Whole words. Probability and statistics was a fun math class because I sat on top of my desk in the back of the room. I was a senior and I spent 90% of class coloring, 10% easily answering the only types of math problems that made sense to me anymore. Becoming an engineer was out. This week I read a piece in the Atlantic about the engineering elementary school in Greenville. I couldn’t help but think about Mr. Mcnitt and the motors. I went to a fine elementary school but those things I learned from Mr. Mcnitt weren’t standard, they were just the result of a kind older man taking interest in feeding a child’s curiosity. I thought about how I would’ve thrived in the engineering elementary school environment. I read that they’re working to build an engineering middle school and have plans for an eventual high school. I hope it comes together soon because I can’t imagine how many little girls could grow up to become women in a male-dominated field if they just had the spirit of a Mr. Mcnitt to guide them when the math gets a little difficult. What a nice story….there is always one teacher that made learning fun! ” and michael rules” sorry couldn’t resist the diary pun!